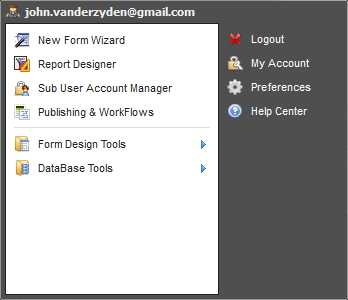 In the lower left corner of the desktop, click the Logiforms icon to display the Start Menu. Here you will find all of the Logiforms modules, access to your Account Management tools, Preferences and the Help Center. Some modules will require that you first choose a form. When you see the Form Selection dialog, simply find your form in one of the project folders and click OK.
Also, the Start Menu contains the Logout menu item. You can select Logout to end your session, but it's good to realize that your account always gets a clean logout when you close your browser window. If you have selected the 'remember me' feature on the login screen, your session will be automatically restarted when you log back in.